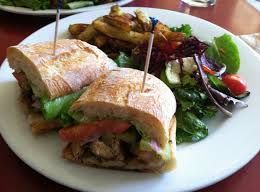 Your choice of white or dark meat with lettuce, tomato and mayonnaise served on toasted bread of your choice: Sourdough, 12 Grain, Whole Wheat or Marbled Rye. your choice: Sourdough, 12 Grain, Whole Wheat or Marbled Rye. Asiago Cheese, Prosciutto, Baby Arugula and Blackberry Balsamic Vinegar on Marbled Rye. Tender roasted Pork Tenderloin, with tomatoes, red onions and Tzatziki sauce served in a warm pita bread. 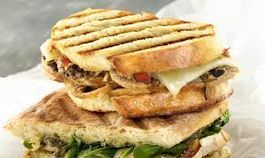 Your choice of white or dark meat with Applewood Bacon, lettuce, tomato and mayonnaise on toasted bread of your choice: Sourdough, 12 Grain, Whole Wheat or Marbled Rye. Tender Grass Fed Beef, with tomatoes, red onions and Tzatziki sauce served in a warm pita. 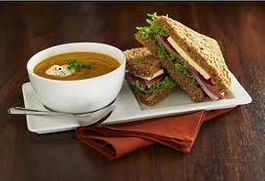 Your choice of half of our turkey sandwich with lettuce, tomato and mayonnaise served on toasted bread of your choice: Sourdough, 12 Grain, Whole Wheat or Marbled Rye with choice of soup or side salad.